Super Mario FX is a title that always comes up in a discussion about unreleased SNES games. So, what is the deal with this title? Let's make one thing clear, I don't believe there was ever a Super FX based 3D Mario game in development at any time. There is no evidence that anyone, including Dylan Cuthbert (the main programmer of Star Fox) or Shigeru Miyamoto (producer of Super Mario 64) stated that Super Mario FX ever existed, even in demo form. 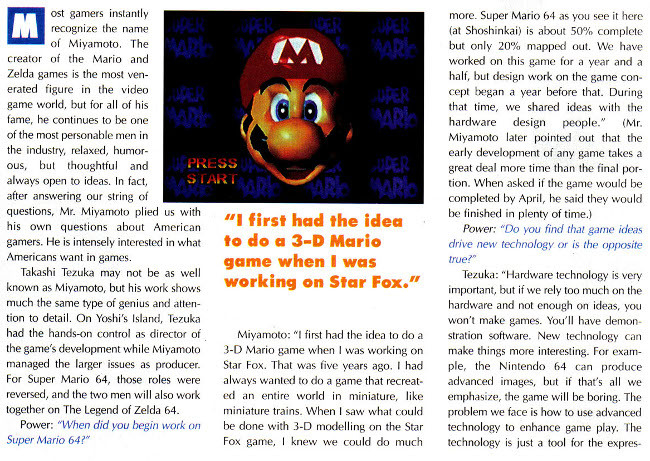 If you look at the Wikipedia page for Super Mario 64 (which talks about Super Mario FX), they also reference an interview from the January 1996 issue of Nintendo Power (see below), which only says he gained ideas for Super Mario 64 during the development of Star Fox. That does not confirm that any 3D Mario game was in development for the SNES. In fact, it basically says they designed the N64 hardware to accommodate what they wanted to do in Super Mario 64. The other thing Wikipedia references is said IGN page, which is not a real source, as it does not say where it got its information from. If you read the IGN page, it is obvious that they were looking at the above article (which mentions the five year development schedule). The only problem is that if you actually read the article, it simply states that he got the idea for making a 3D Mario game while making Star Fox (which was in development five years previous to the publication of the article), not that he was actually developing a Super FX Mario game. Nintendo announced Project Reality in August 1993 - only a half a year after the initial release of Star Fox. It is implausible that Miyamoto would work on a Super FX Mario game while also working on the Nintendo 64 hardware. There was several prototype games for the Super Famicom, several of them were made by Nintendo themselves. The most talked about of them is probably the three dimensional Super Mario-game which was developed after the development of Star Fox. Shigeru Miyamoto has said that the project was disbanned (sic) because of technical limitations but it was later used as a fundation (sic) for Super Mario 64. Some people near Nintendo of Japan say Myiamoto (sic) is experimenting tridimensional (sic) animation for a Mario game using an advanced version of the SFX chip. Chances are this could be the first step of Mario into the 3D world. However, this is just an unofficial rumor since Nintendo's High-Ups deny it. This was in the "rumours" section of that magazine. It seems unlikely that Nintendo would have been making a 3D Mario game for the SNES in early 1994, when they were actively developing software for the Nintendo 64. To finally put the speculation to rest, I asked Dylan Cuthbert about it on Twitter. He says Super Mario FX never existed, and it was merely the code name for the Super FX chip itself. 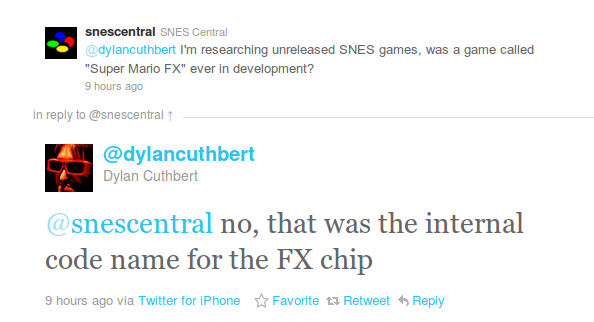 Dylan Cuthbert himself says that Super Mario FX didn't exist. I hope this puts the matter to rest. Super Mario FX was never in development, and was never planned for development. The only Mario game to use the Super FX chip was Yoshi's Island. Speculating on the existence of Super Mario FX is wishful thinking.